5:59 AM I haven't read this book yet but I definitely plan to. 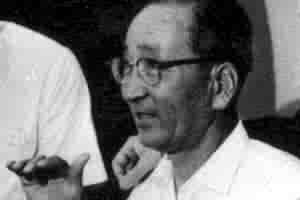 It highlights (among other interesting stories from WW II) the conversion of Mitsuo Fuchida, who led the attack on Pearl Harbor. 5:54 AM A thank you to Zac Hensley for adding DBO to his blogroll. 5:53 AM The latest addition to our home page is called Origin of the Specious. 5:51 AM Tuesday shout-out to Matt Rondeau for his help yesterday putting up fencing at the farm. He and Liz and their adorable sons Caleb and Isaac stopped by for a visit. Becky and I managed to get all the rose bulbs planted. No time for a ride on Trav -- had to take the trash to the dumpsters. 7:16 AM Here are some recent openings in religion, theology, and Old Testament. 7:10 AM I see that Israel is promoting its beach industry to sun-and-surf tourists. I don't think I'd go to Israel just for the beaches, but I can tell you that Ashkelon has decent waves. I body-surfed some pretty mean 12-footers there back in 1987. 6:57 AM We spent a delightful morning and afternoon with Matthew and Elizabeth Rondeau yesterday at the Masonic Home for Children in Oxford, NC. Matt is the chaplain at the home. 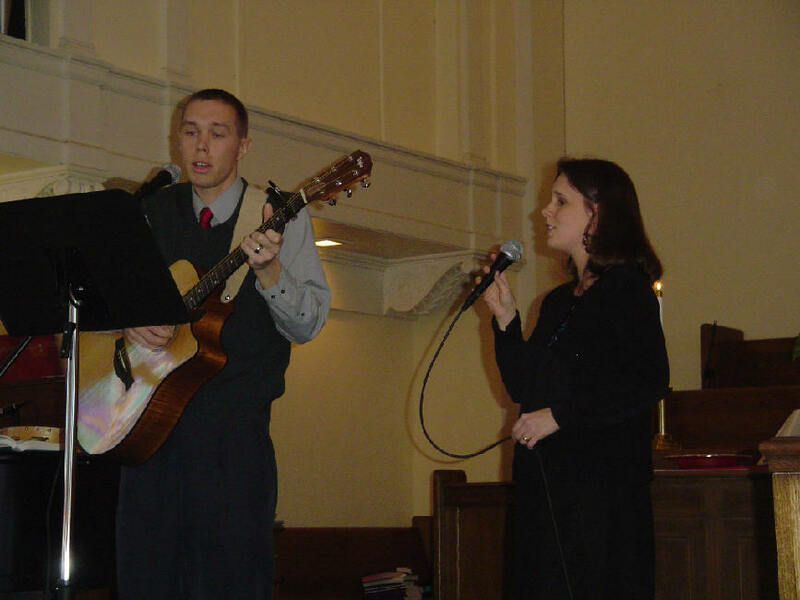 Pictured are Matt and Liz singing a beautiful song on the Bride of Christ after Matt had spoken on the church as being the people of God and not a building. Matt is working on his M.Div. at Southeastern and is an excellent Greek student. They served up a delicious German Vinegar Roast for lunch, then Matt gave us a tour of the buildings and allowed Nathan to play the chapel's organ. I think I've almost talked Nathan into giving an organ recital there this spring. I have never heard better acoustics, and I have been in a whole lot of chapels and cathedrals. Becky and I spoke to the young people on what God is doing in Ethiopia and shared with them the testimony of Emebet and Bereket. The slide you see on the wall shows Bereket with the only doctor in all of Ethiopia who performs cornea transplants. And get this: his corneas are shipped to Addis from the US. Afterwards the audience collected an offering to raise Bibles for Ethiopian children. America is still the most prosperous nation on earth and its people still generous. Matt and Liz are good representatives of our seminary student body -- dedicated, hard-working, Jesus-loving, humble servants of the Lord. 6:52 AM This is shaping up to be a busy week at Rosewood Farm. Tonight we are having a couple from a neighboring farm over. They were of great help to us when we first moved into this community and have become dear friends of ours. On the farming front, Becky and I are planting her rose bulbs this morning, then Nathan and I hope to get several hundred feet of fencing put up this afternoon. Nathan has also started planning what crops we will plant this year and where. (I told him I want lots of corn.) 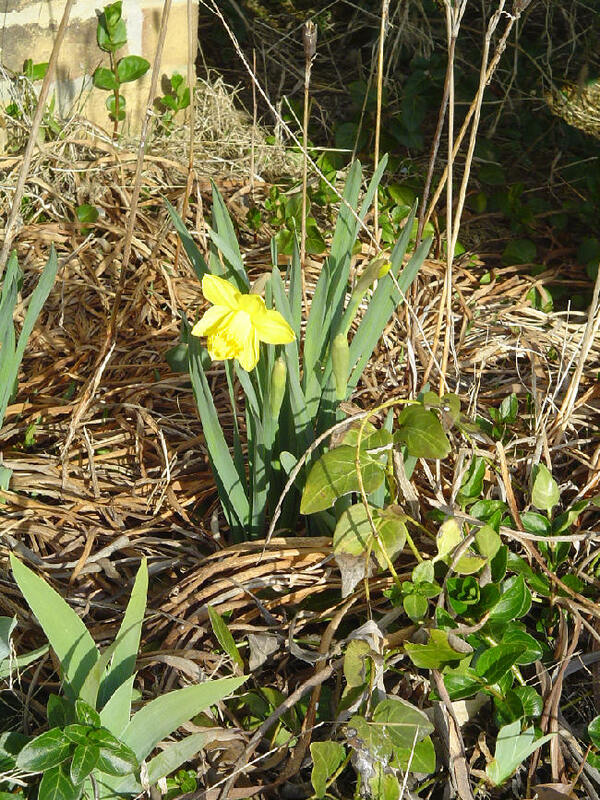 Overall, it sure feels like Spring is arriving early around here. One other note: Becky is in the final planning stages of her next visit to Ethiopia in May. I say "her" next trip because this time she will be taking our son with her instead of yours truly. This will be Nathan's second trip to Ethiopia (the first he made with his granddaddy). I'll stay behind and work the farm. And this is exciting: Becky will be taking along her parents. As they are getting up in years this may well be their last trip to the land where they served so faithfully as missionaries. 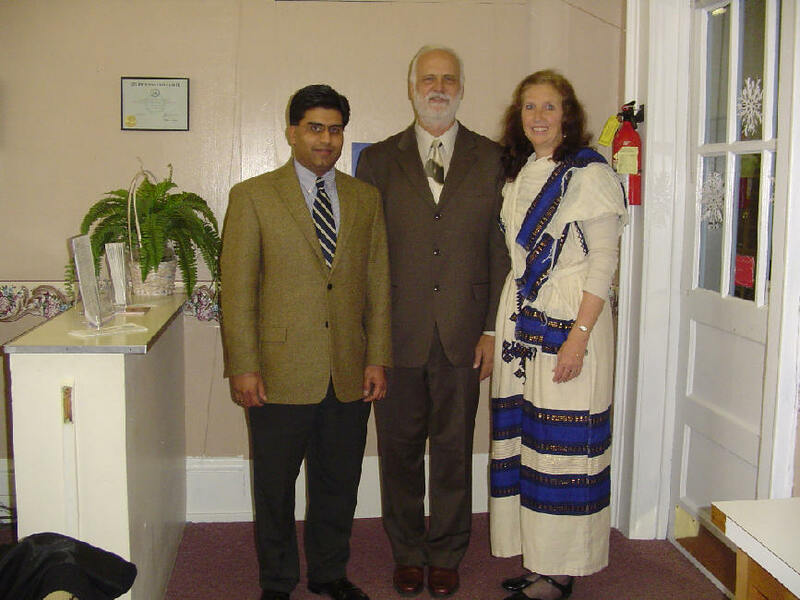 The goal is to have them visit their missionary stations in Hosanna and Burji and to meet with as many former students of theirs as possible. 6:47 AM On this day in 1915, The Valley of Fear by Arthur Conan Doyle was published in novel form. This is one of my favorite Sherlock Holmes stories. To read this classic online, click here. 8:33 AM Please join us in wishing Bereket a Happy Birthday. It was just over a year ago that God brought him to Addis for his cornea transplant and, while he was there, Bereket believed in the Lord Jesus Christ and was added to His church. The date was February 26, 2005. Happy First Spiritual Birthday, Bereket. We love you. 8:31 AM A handful of news and notes and personal items. I am alone at the house this morning because Becky is working a shift at the hospital. She does this for Ethiopia. I know of no one more selfless and other-centered than she.... Last night the Disciple Now Conference got off to a great start. It's a joy training the next generation of leaders to be what God is calling them to be. My age must be showing, though. After I mentioned in my talk that youth can be single without being chaste, Tim Bowes said a young lady told him, "I haven't been chased in a long time." She was serious.... We showed a great clip from The Man from Snowy River last night -- one of the most enjoyable movies I've ever watched and one with a subplot unnoticed by many: coming of age....I've been asked to portray General Lee next January at the North Carolina State Capitol in Raleigh. Incidentally, did you know that at least 5 men do Lee impressions in Virginia and North Carolina? 7:43 AM The latest addition to our homepage is called Church as Meetinghouse. 6:55 AM Alan Branch offers a balanced evaluation of the controversial theology of Joel Osteen. 6:49 AM Everything you wanted to know about salsa. I’ll admit it: I love the stuff. The one thing I missed the most in Ethiopia were my Doritos and dip. Thank you for giving me a place to visit on the web and be challenged and inspired on a daily basis. That’s exactly the same way I feel about Jon’s site and a dozen others. The cyber-community is a big joy in my life and I thank God for it. 6:40 AM I can hardly believe it's been been 35 years since I did big wave riding on the North Shore of Oahu. What do you do when you are being held under by several tons of white water? Relax. The harder you struggle, the more rapidly your air supply is depleted. The best thing you can do is to allow the wave to "release" you until you can grab a quick breath on the surface before being dragged down by the next wave in the set. Nervousness doesn't help. I've found this to be true when riding my horse as well. Nervousness is easily transmitted to one's animals. I'm learning the importance of going through life with as much calmness of spirit as I used to have when I surfed the big ones. 6:37 AM This weekend I’m helping with the Discover Now youth conference in Roxboro, NC, sponsored by Youth for Christ. It will be held in the National Guard Armory on Hwy. 96. Organizer Tim Bowes has put together an excellent program. I’ll be speaking on Friday evening and twice on Saturday. The topic is the myth of adolescence. There are huge implications to be considered. 5:16 AM The latest addition to our home page is called Reformation, Revival, or Restoration? 5:14 AM Christian websites are attracting Muslim readers. 5:11 AM Regent University in Virginia Beach, VA announces an opening in Biblical Studies. 5:09 AM “More importantly, the evidence we’ve examined thus far should be causing us to seriously question all the assumptions we hold about one-man ministry.” Read more. My friends, the blogosphere offers us opportunities to faithful put forth clear witness for Christ in large and influential numbers. So perhaps the final word is appropriately a warning. Like any technology, it can be used for good or evil. In his book Hugh reminds us, “The blogosphere is about trust.” Let’s pray for each other, dedicate ourselves to be worthy of the trust that our readers give us. Let’s hold each other accountable and pray that our postings will only encourage more and more people to trust both the messengers—and more importantly, the message that we bring. 4:59 AM I hope you aren’t getting tired of our updates on Ethiopia, but I just had to share this story with you. January 12, 2006 (January 4, 1998 in the Ethiopian calendar) was a historic day in the town of Alaba. I witnessed the first working session of the Alaba Translation Team (see photo below). They translated Mark 1:12 from Amharic into Alabinya. Then they back translated the verse into Amharic, and from Amharic into English, so that I could check their work against the Greek. Needless to say, that was a an awesome experience for me. Next time I’m in Alaba I plan to meet with the team and do more checking. Strewn among remote farm communities across the nation, Back Country Folks are a long way away from economic paradise. The residents tend to be poor, over 55 years old and living in older, modest-sized homes and manufactured housing. Typically, life in this segment is a throwback to an earlier era when farming dominated the American landscape. Not too bad a description – except that later they add a blurb about bird watching. I know of no one who watches birds unless they plan to shoot them. 4:51 AM Over at Home Works there’s a great essay on the age-integrated church. Highly recommended. 4:45 AM Textual students, in your study of the variant reading in Rom. 5:1 this weekend why not take a look at A. T. Robertson’s comment on that verse? 6:03 AM Please join me in welcoming another SEBTS blogger to the blogosphere. 5:58 AM We had a great time showing the Saenz men (Rick, Chris, and Matthew) around the farm yesterday. 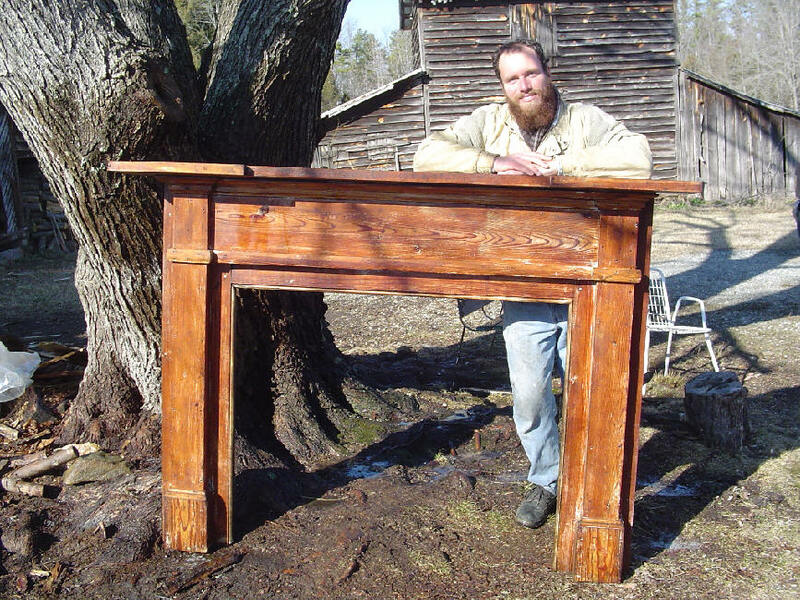 We've only been homesteading for a few years but we are happy to share with others our limited knowledge, including what we've learned from our mistakes. We talked about raising animals and what is involved in animal care. Here Chris and Matthew are watching me feed Traveler his daily oats. Trav requires a feed supplement (in addition to hay) because he is is being ridden (not to mention the fact that, as a Thoroughbred, he burns calories just standing still). The same would be true for any work animal. I feed Traveler over the fence because if I place the bucket on the ground in the pasture he will become overly protective of his oats (I have seen him pick up a goat with his teeth and hurl it 10 feet into the air if it tried to eat "his" oats). Below, Nathan uses the satellite map we made of our property to explain why we bought our farm where we did. We live on 123-acres surrounded by other large farms. It is unlikely that any of them will be sold or subdivided into lots in the near future. The local economy is depressed and the nearby towns are dying. This, to us, was an asset in terms of location. 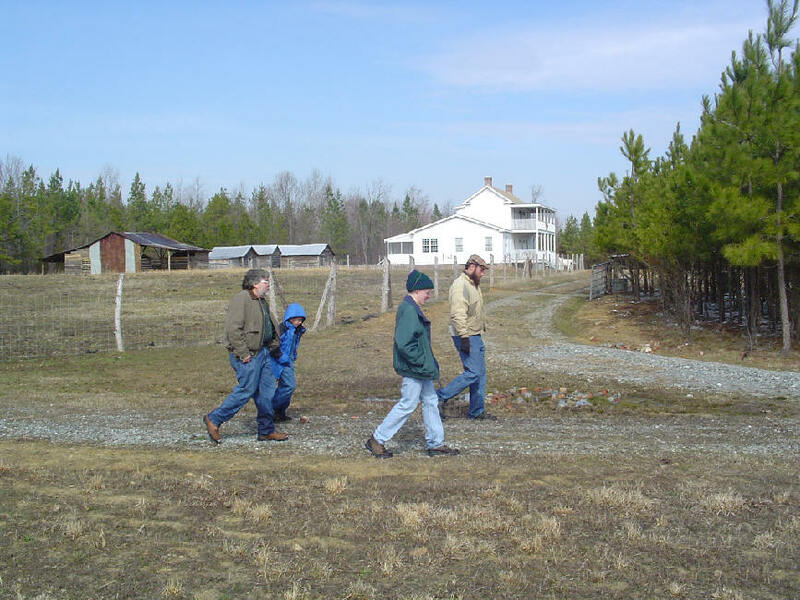 We recommend that new homesteaders give a great deal of thought to the size of their property. 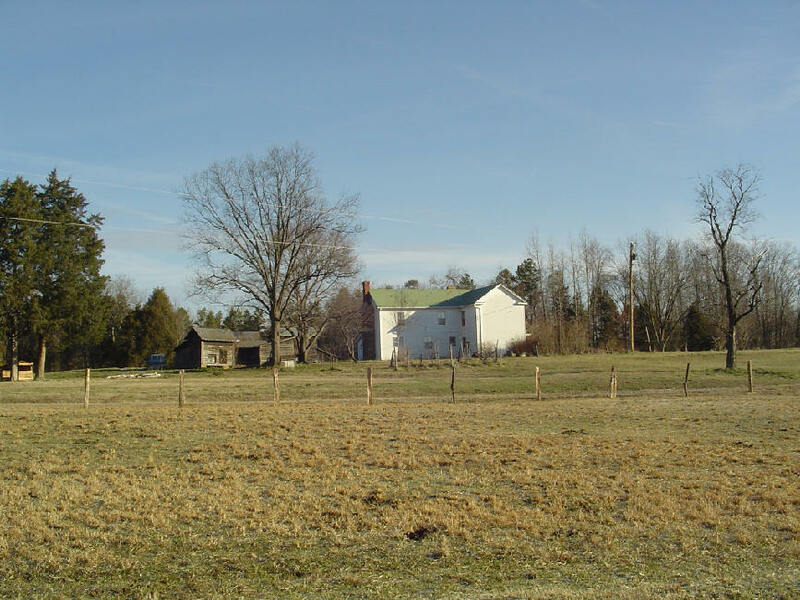 Our lower limit was 100 acres because we wanted our farm to be inter-generational and because we wanted to protect it against encroachment from neighbors or developers. 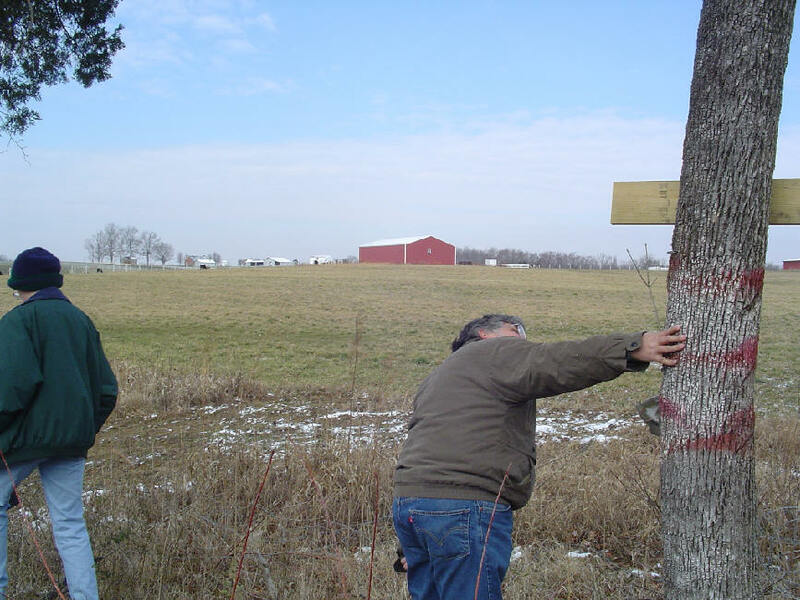 Another consideration was the fact that about 80 percent of our land is wooded and trees are an extremely valuable "crop." This crop needs careful management, and the satellite map helps us do long-range planning of both our pastures and our tree stands. Our land is carefully posted against hunting and trespassing. Here Rick is reading one of our hand-made signs. In the background is a neighboring farm that is used mainly for raising beef cattle. Eventually we will fence in the entire farm so that we can expand our own beef and goat herds. We are very careful about protecting our herds from predators and always keep a firearm handy. Below is a good shot of our home and its surroundings. Becky Lynn has always wanted to have a ministry of hospitality. Thus it was important to us to build a house that would be suitable as a retreat center, based on the model of Francis Schaeffer's L'Abri. 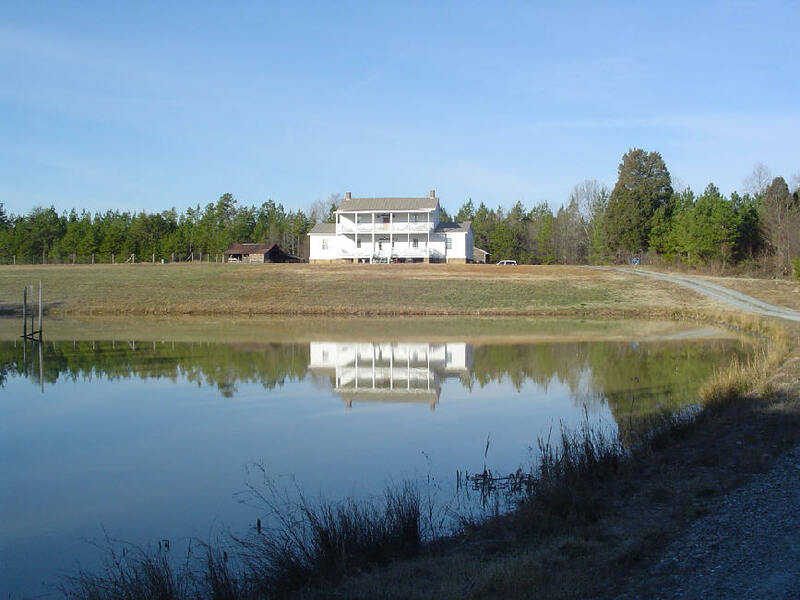 The entire upstairs portion of the house is given over to guests, who come from all over the country to spend time retreating at Rosewood Farm. 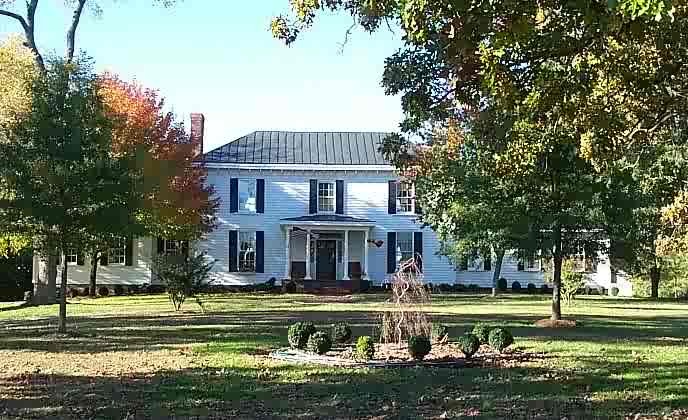 It took us three years to construct Bradford Hall, which we modeled after an 1820s farm house that had been "added to" in the twentieth century. The outbuildings were constructed to fit this scheme, and all of our electrical lines were placed underground in keeping with the ante-bellum "feel." In constructing the outbuildings our only expenses were for nails. We can't see spending a penny on materials when we can scrounge what we need from neighboring farms (always with the owner's permission). 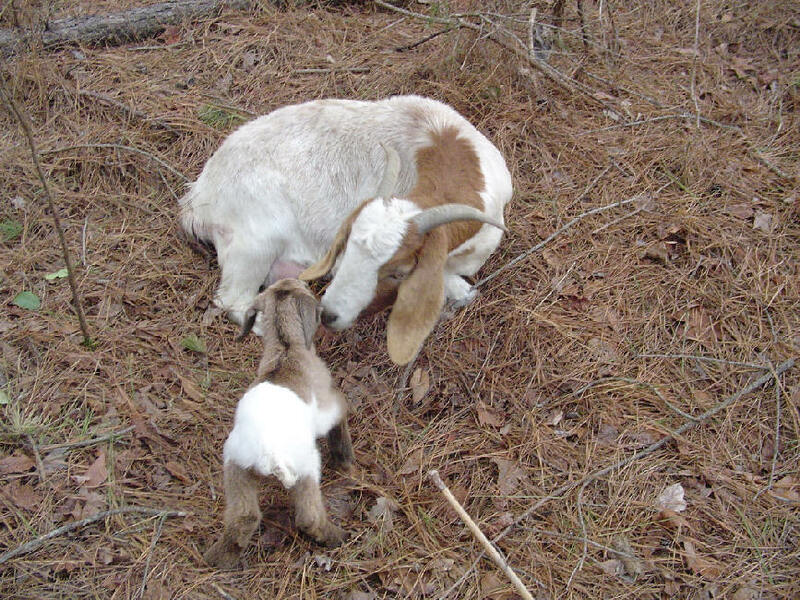 We hope to double or triple our goat herd this year and add more beef cows. We are now completely self-sufficient in the meat department and hope to be the same with our vegetables in the very near future. 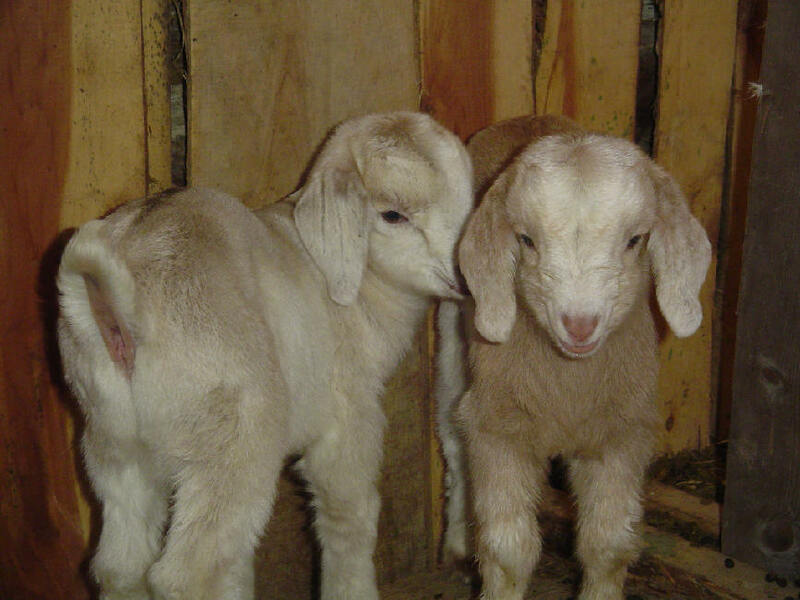 The male goats will either be sold or end up in our freezer, and the females will be bred. Here's Chris scratching Snowball. In addition to working on the farm, we spend plenty of time enjoying the animals. We do not see ourselves as belonging to an agrarian "movement" but as simple farmers who desire to be responsible neighbors in our community and, above all, good stewards of what the Lord Jesus has given us to serve Him and expand His kingdom. We thoroughly enjoyed getting to know Rick and his sons and look forward to hearing his interviews when he finishes editing the CDs. 8:05 AM Yesterday was one of the those experiences that leave you breathless and full of unspeakable joy at the same time. Our morning started out with a visit to the local nursing home where we sang and spoke briefly on Ethiopia. 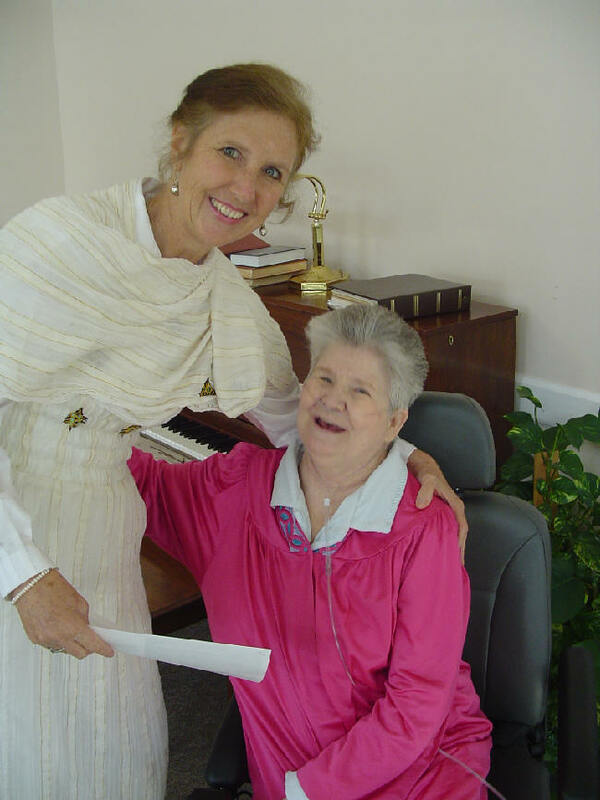 Here Becky is with one of our dearest friends at Meadowview, Betty White, who loves to sing and play the piano. 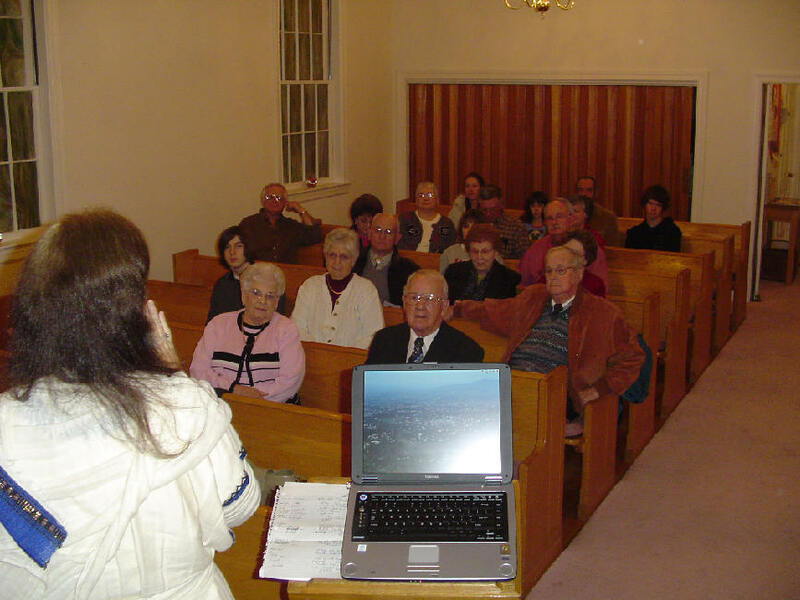 Then it was on to Wyliesburg Baptist Church to give a follow-up report on our mission trip. There we were welcomed by our good friend and neighbor Rodney Barwick who is doing a great job shepherding the flock of God and has a passion for world evangelism. Here he is gladly submitting to wearing an Ethiopian Gabi during the morning service. In the evening we renewed fellowship with our good friends Doug and Janie Cutts of Norlina Baptist Church and their wonderful congregation. 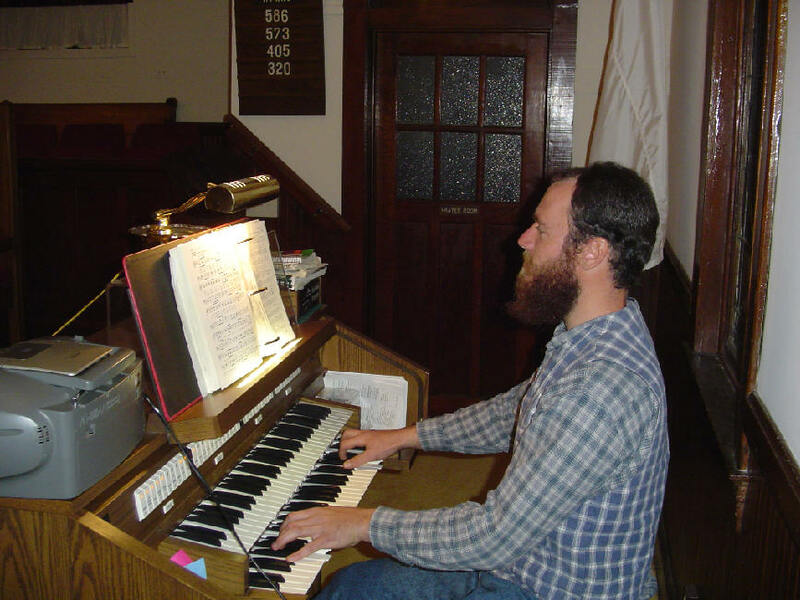 After the service Nathan treated everyone to a spontaneous organ recital, including an original arrangement of one of my favorite hymns, A Mighty Fortress Is Our God. I felt like I was back in the Basel Muenster. Today we are enjoying sweet fellowship with Rick Saenz and his sons Chris and Matthew. 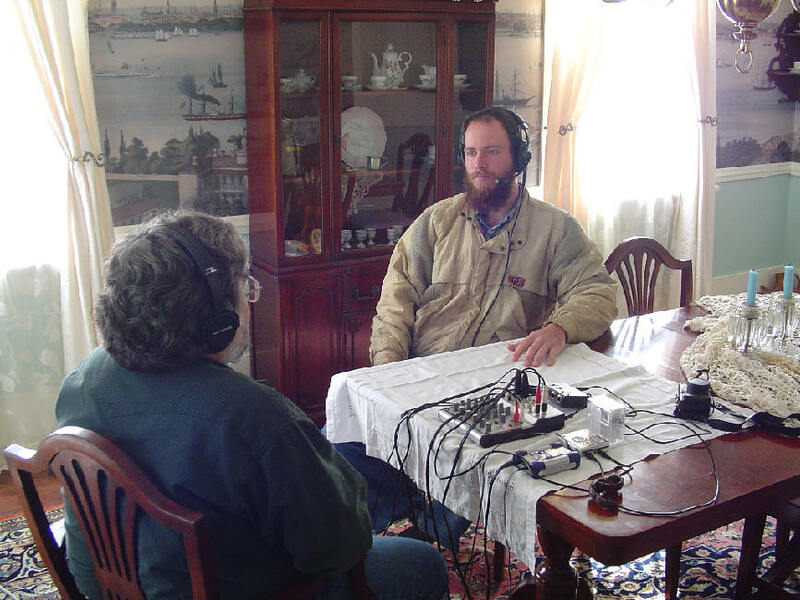 Rick is here interviewing us for his series on agrarianism. If there's one thing I've learned from homesteading it's that God doesn't need us but we desperately need Him. Growing crops and raising livestock, if nothing else, should teach us that invaluable lesson. Well, if you'll excuse me, it's time to put the hotcakes on the griddle. Talk at you later! 8:27 PM Just back from a whirlwind trip to teach in Richmond. Wonderful class. My favorite part was when the students read their interaction papers. A big "Gracias" to Becky Lynn and Lisa for preparing some terrific Mexican food for lunch. The entire class enjoyed it. Becky and I had to laugh out loud at several signs we saw along the road, including "Tomahawk Baptist Church" and "Open Door Reality." My favorite was "Van Go Shuttle Service." The light dusting of snow the Lord sent to decorate the pines made the 3-hour drive home a pleasure. Looking forward to tomorrow, we sing at Meadowview Nursing Home at 9:30, speak at Wyliesburg Baptist Church at 11:00, and show our Ethiopia pictures at Norlina Baptist Church at 7:00. Right now I'm catching up on emails and preparing to dive into a book on the attack on Pearl Harbor. 9:38 AM We've just published our sixth and final report on our trip to Ethiopia. Be diligent to present yourself approved to God, a worker who does not need to be ashamed, rightly dividing the word of truth (2 Tim. 2:15). But I discipline my body and bring it into subjection, lest, when I have preached to others, I myself should become disqualified" (1 Cor. 9:27). In Greek the word “approved” carries the idea of standing the test, being tried and true. All Christians, whether leaders or not, ought to be approved in Christ, approved unto God, and approved of men. Even the world, which hates Christians and despises what we stand for, should be compelled by our conduct to acknowledge our genuineness and respect our integrity. Today we hear vociferous criticism of those who express disapproval of ungodly pastors as though censure of such were unbiblical. It does not matter, however, to what extent an elder may be given honors and titles if he ignores the weightier matters of integrity, truthfulness, and honesty. “Approved of men” does not mean popularity and the endorsement of carnal Christians. It means that the supreme test of our Christianity is not our orthodoxy or what we publish in our books but the Spirit of Christ in our daily living. Schisms, then, have a surprising usefulness – they reveal the tested and approved ones. That is a great blessing to the church of Jesus Christ! 7:39 AM A very nice thing happened yesterday. My wife had purchased from Best Buy a DVD recorder that was supposed to work with our VCR. It didn't, but because we had been in Ethiopia the refund window had closed. After speaking with several people at the store, one of the managers, knowing full well she was "breaking store policy," graciously allowed us to receive store credit for the purchase. The Best Buy is located on Capital Blvd. in North Raleigh. A big "thank you" to the management, and may your tribe increase! 7:35 AM In case you didn't know, we have a webpage devoted to Unleashing the Church, which contains links to essays dealing with restoring the church to its New Testament patterns. Feel free to drop by and peruse it at any time. 7:30 AM Textual students, here's a useful chart of the various text-types in the New Testament and their leading witnesses. 7:23 AM Brent Davis shows why debating "worship styles" is totally irrelevant. 7:21 AM Trinity Christian College in Palos Heights, Illinois, has an opening in theology. 7:18 AM Friday morning shout out to Abidan Shaw, Principal of Norlina Christian School, who invited Becky Lynn and me to speak in their chapel service yesterday morning. Abidan was my teaching assistant when he was a student at SEBTS. 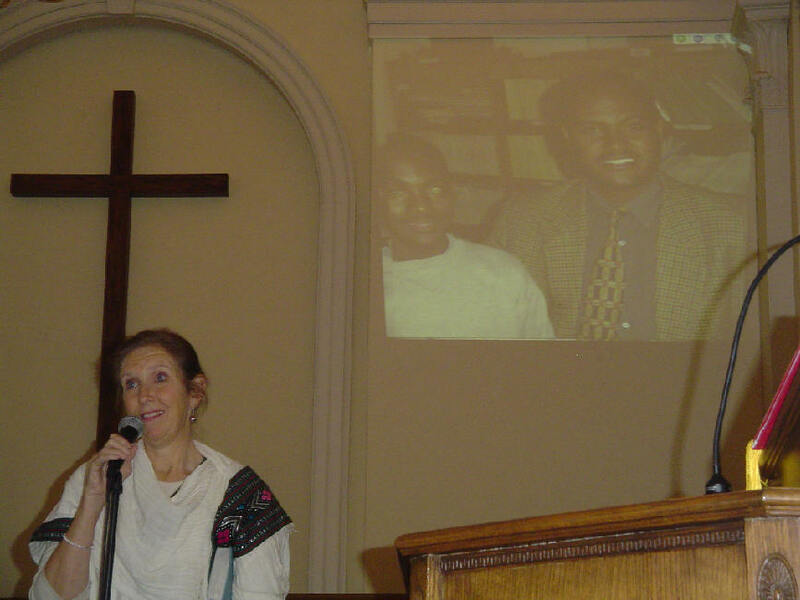 We showed slides and video clips of the church in Burji and told the students what the Lord Jesus is doing in the lives of two of our adopted children, Emebet and Bereket. A huge surprise for us was that after the service the students donated $158.07 for Bibles for Ethiopian children, and the teachers and staff donated $200.00 for the Alaba churches. Thank you, Norlina, for your generosity! 6:55 AM Love has a malignant tumor. 6:51 AM Here we are, surrounded by umpteen Bible translations in our households, and still we are afraid to follow the Bible’s clear teaching about salvation, sanctification, ecclesiology, etc. Sounds like the falling away of the evangelical church. The truth is, the time has arrived where Evangelical ministers and pastors must once and for all leave behind this humanistic “self-esteem” psycho-babble which has crept into our Lord’s Church. We must start teaching the whole truth once again, a central part of which is that apart from Christ, we simply are not those delightful little creatures we human beings would like to think we are. Sorry to sound so negative, but things are just that bad. 6:46 AM Consider the revenge of the worms. Also, why has “for such a worm as I” been replaced by “for sinners such as I”? In churches of today, many attendees walk into a building, sit in rows looking at the back of one another's heads, sing pre-selected songs, eat bit of cracker and drink a thimbleful of grape juice, drop some money in the offering plate or box, listen meekly to the preacher's homily and shakes hands after the service with those around him. In the ekklesia of the New Testament, active participants came to their host's home with food and drink to share with each other for evening meal. The bread was broken and shared among them as was the cup of the new covenant while they remembered our Lord's suffering and the joyful expectation of the wedding feast to come. Songs, prayers and praise were freely and spontaneously offered. Others offered words of instruction, exhortation, and encouragement. Prophecies were given for edification and comfort. Sometimes ideas were shared that needed to be challenged, debated, and corrected and this was t done in humility and gentleness. People gave cheerfully to those in need in their midst and to those who labored among them in word and doctrine. That's a pretty significant contrast. 6:37 AM What can we learn from a sheaf of old letters in Egypt? Plenty. 6:34 AM My good friend Reed Heustis discusses truth in politics. Reed is correct: The devil has scored a great triumph here – Christianity has become “churchy,” singing a few hymns, speaking a good word for God, all the while becoming very worldly, conforming to the age instead of condemning it by the contrast of godly conduct. It bespeaks love of the world, which does not coexist with love of the Father. 6:28 AM Nine books to examine before you read the Da Vinci Code. 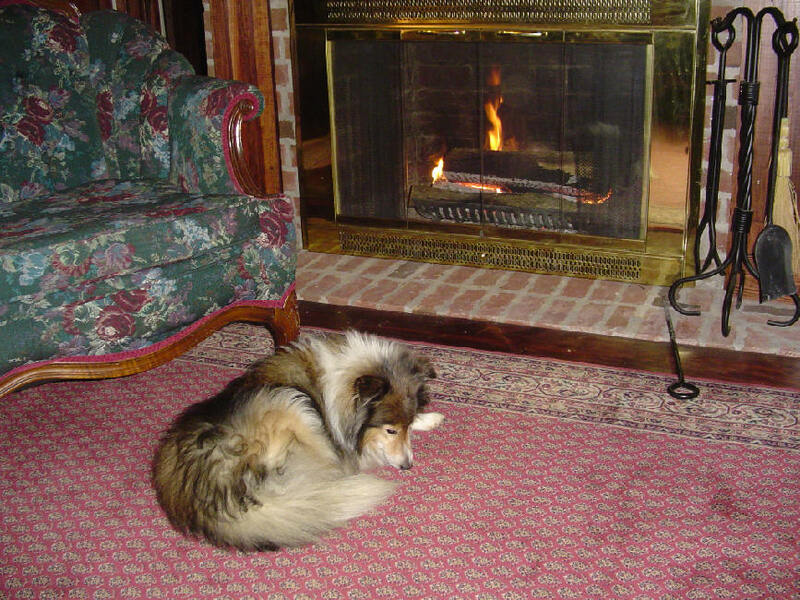 6:25 AM "Outside of a dog, a book is a man's best friend: and inside a dog, it's too dark to read" (Groucho Marx). 6:22 AM Are you feeling “Olympic-y” yet? 6:20 AM A student sent along an email to say that the Dead Sea Scrolls will be in Charlotte, NC from Feb.17 to May 29, 2006. 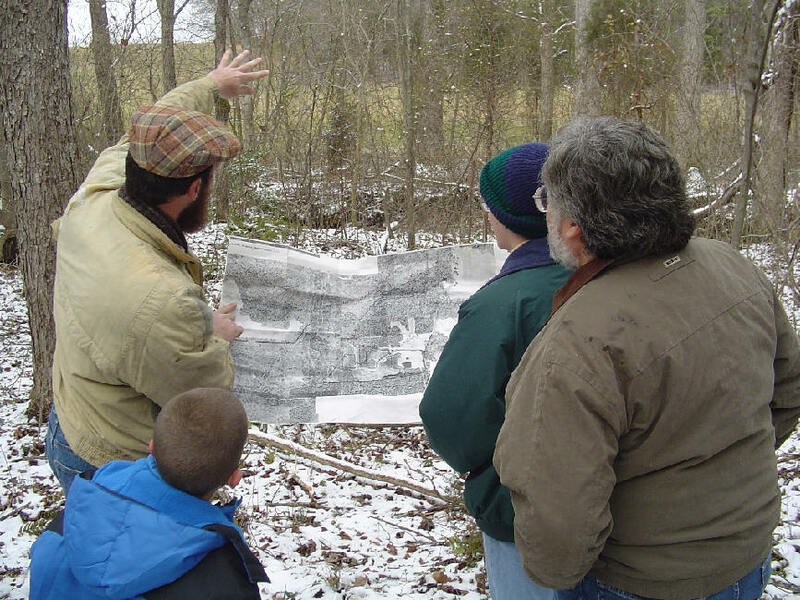 Go to www.discoverscrolls.org for more information. 6:16 AM Carson-Newman College in Jefferson City, Tennessee announces an opening inBaptist Studies. 6:15 AM Greek students! I found this study of p72 (.pdf) by Tommy Wasserman to be fascinating. It shows you just how much hard work is involved in manuscript research today. Tommy is a member of the Evangelical Textual Criticism team. 8:16 PM Prayer alert: Will you join us in interceding for the suffering and persecuted church in Alaba, Ethiopia? This is exactly where Becky and I were ministering just a few weeks ago. Things are only getting worse. If you would, please read this report on the current situation. Becky and I know personally several of the people involved. Pray that the believers in Alaba might be strong in the Lord and in the power of His might. Thank you. It was so inspiring to read your article "Why We Must Insist On Every-Member Ministry" which was forwarded to us by a brother. We live in Ghana, West Africa, I am a brother in a house church fellowship here. We have been meeting at homes for few years now. Most of us came out of churches where our souls were continually vexed by teaching and practices that have no place among God's people. What a blessing to now be able to concentrate on what needs transforming in us…. We would love to communicate with you so that we can build one another up and strengthened each other on to faith and good deeds. It is our hope and prayers that God will bless our relationship and that it will grow and bear good fruit. If we can be of encouragement to one another we will certainly be fulfilling one of the most prominent needs of the Body of Christ. It reminded me yet again of how the internet allows brothers from all over the world to stay in touch and encourage each other. 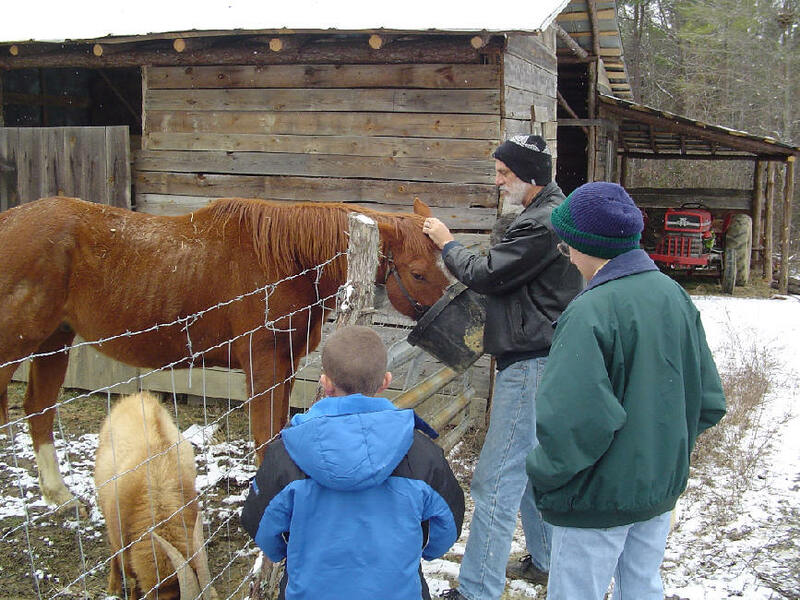 6:34 AM My son found this link: Getting Started with Livestock and Farming. 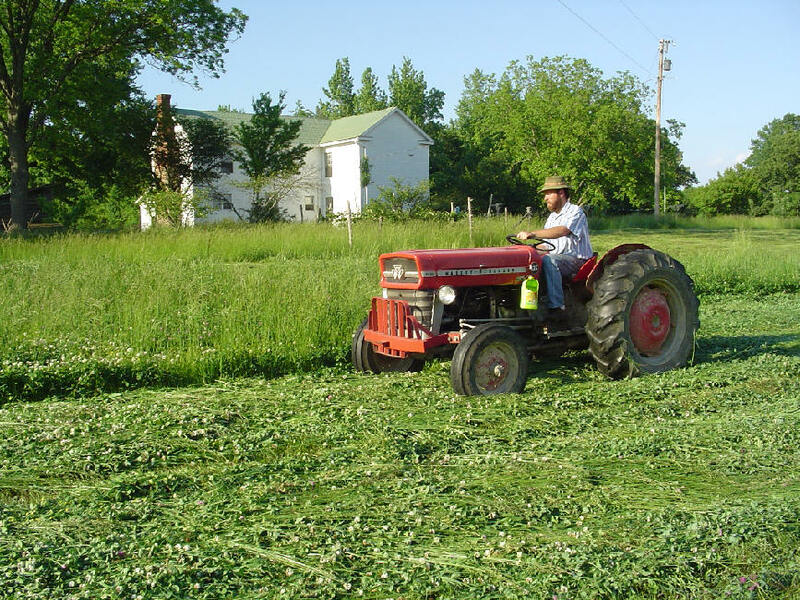 The article is worth reading for what it says about tractors alone. What would we ever do without our Massie-Ferguson 135? 6:30 AM Part 5b of our Ethiopia Report features the village of Deda. Our sixth and final report asks, "Where do we go from here?" We'll publish it later this week. 5:04 PM Almost forgot to show you pics of the latest newborns. Bes ("Black-Eyed Susan") and her baby posed for this photo. Well, sort of. Seems the little guy never stops eating. And here are Chamomile's babies. Ain't they sweeeeet? Now here's some really good news. Aster dislocated her left hip while giving birth to twins (she lost the second one) and could hardly stand up. That was two days ago. Today she is back on her feet and her gait is almost normal. What an answer to prayer. Thank you, Heavenly Father. Our project du jour: stripping two layers of paint (brown and white) off an old mantle we scavenged from a house in North Carolina. Forget using paint remover that's "guaranteed to work." It doesn't. We ended up using oven cleaner and it did the job perfectly: the mantle is now restored to its original 1840s look. It will go in Nathan's upstairs bedroom. 6:18 AM I misspoke earlier when I mentioned that we had 7 baby goats. We have 6 so far. Two were still-born. The sweetest little things, too. But we rejoice over the ones that made it. I couldn't raise livestock unless I believed in the absolute sovereignty of God, the One who gives (and takes away) life. 6:12 AM Good morning one and all. Hope you had a good Lord's Day yesterday. One thing is certain: I've got the biggest little church family in all of Southside Virginia. Becky and I shared there in both the morning and evening services and were thankful for the opportunity to tell these folks how much we love and appreciate them. I tell people in Wake Forest that I attend a "mega" church ("mega," of course, can mean "great"). They think my church must have several thousand in attendance. Actually we have 35 on a good Sunday. But Averett is a great church because at its core is a group of people that love the Lord Jesus passionately. We have also have some dedicated prayer warriors who intercede for us while we're gone. What do you say to such wonderful brothers and sisters? I guess "Thank You" will have to suffice. 7:42 AM Had a light dusting of snow last night. Amazing -- this is the closest we've come to a snow storm all year. 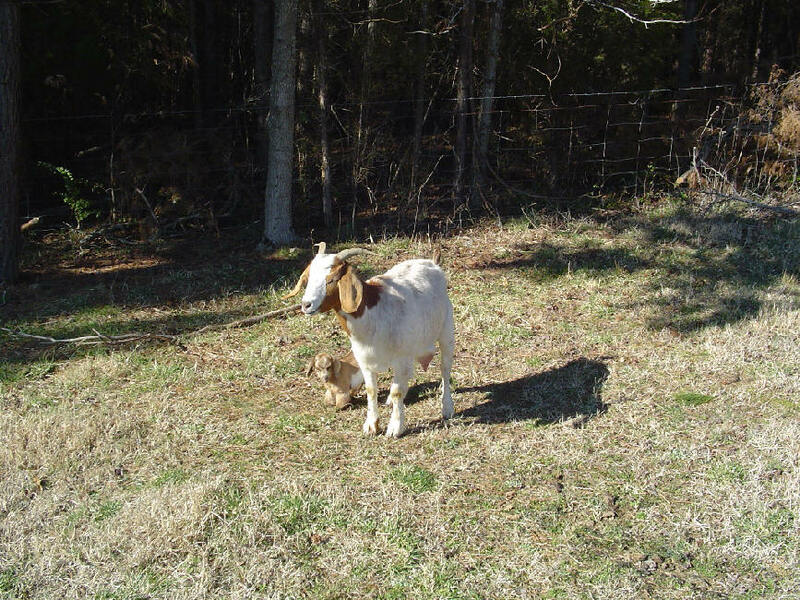 Do you suppose the Lord is thinking about those baby goats being born in Southside Virginia? 7:34 AM Jonathan Grubbs has just posted some very helpful links to the New Testament church model. 7:23 AM My good friend Don McDougall of the Master's Seminary describes how we can mentor young men to become elders in the church. This is something each local church and every family should be doing. The good news: It's rarely ever too late to start. It is difficult to imagine what sort of epistemology (theory of knowledge) would validly lead to all the rights espoused in the Universal Declaration—for example, to participate in artistic and cultural endeavors (Art. 27), to compulsory elementary education so that the individual can fully develop his or her personality (Art. 26), and holidays with pay (Art. 24). 8:10 PM This week in chapel Michael Green of Oxford spoke on the New Testament church according to the book of Acts. Nothing new here, except that he brought out the truth in a remarkably refreshing way. From Acts 20 he described Christian leadership. I noted he didn't once use the word "minister" to refer to church leaders. I myself repented of that fallacy years ago, and would urge my readers to join me in my penitence if you haven't done so already. To listen to Michael Green, click here. 7:52 PM Quick blog update: Just returned from our Valentine's Day social with our wonderful church family. Great food and fun. After the festivities we stood around the piano and sang our hearts out -- the great old hymns of the faith. Much of it we sang Acapulco. We could have stayed all night. 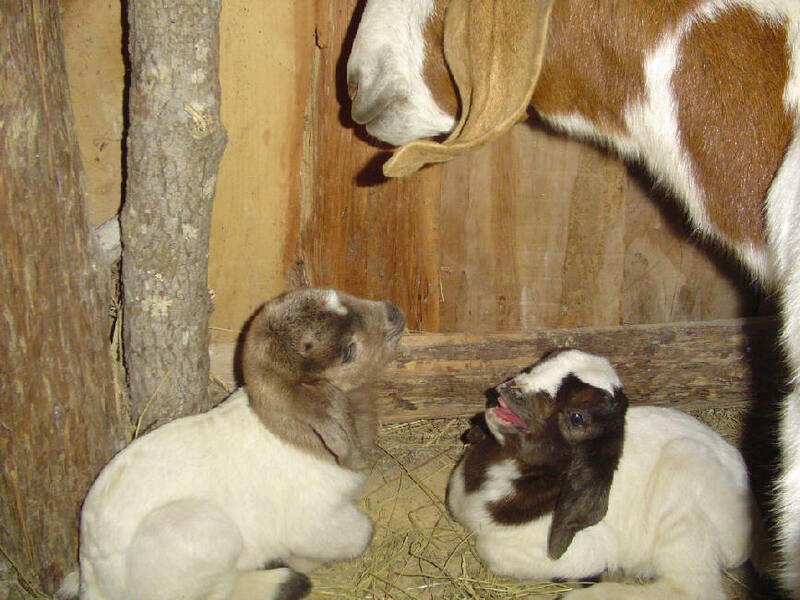 Just a foretaste of heaven I guess....Had 3 more baby goats born yesterday and today, making a total of 7 so far. 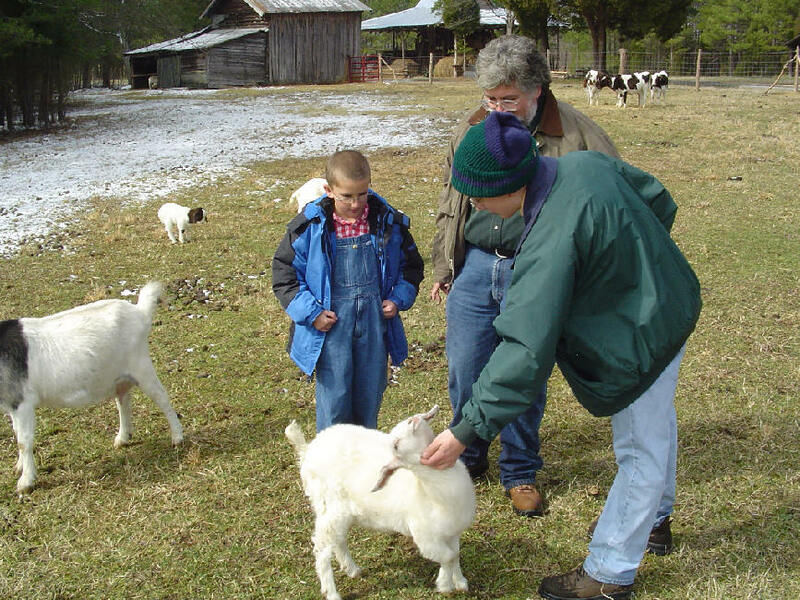 As you would expect, we are paying close attention to the weather and the goats' warmth. We're watching the satellite; so far the snow has stayed to the west of South Boston, which is good news for us... Tomorrow I'll be speaking on having a passion for missions and in the evening we'll be showing slides and video clips of our trip.... Had too much rain today to work on fencing. For some reason, the Lord knew my body needed a rest. 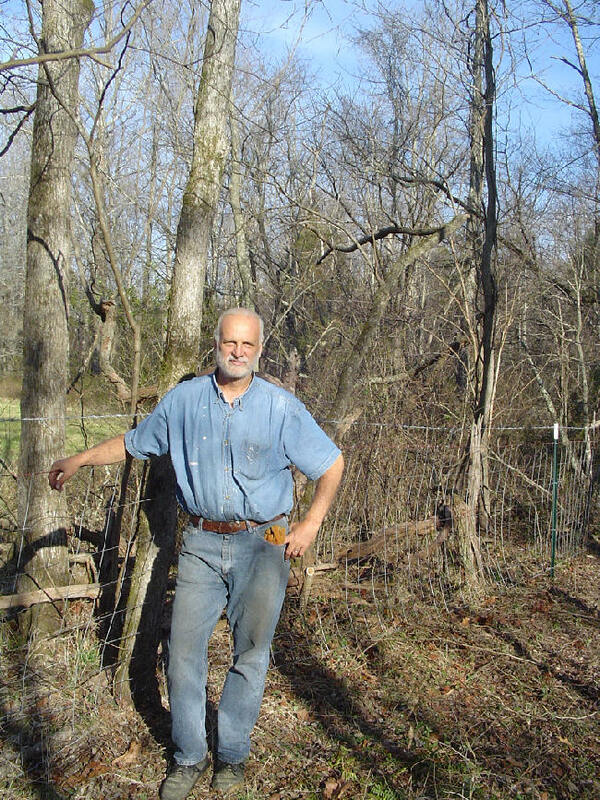 Yesterday we put up 660 feet of fence wire -- a farm record. Life is good. 11:20 AM Our latest Ethiopia Update is called Walking on Holy Ground. And how about a hand for Cosmos and her twins! I think we may have to start another naming contest, don't you? Look over there! It's Nathan's farmhouse. Hasn't the Lord Jesus given us a bright, sunny day in which to serve Him? Well, it's time to return to Bradford Hall. We've got lots of work to do. Enjoy your day! 9:51 AM Howard Payne University has announced an opening in their School of Christian Studies. 9:46 AM Over at C. S. Hayden’s blog there’s a good discussion on the supremacy of Scripture. Yes of course, Scripture is supreme. The problem, however, is that a lot of sound orthodoxy may coexist with outright disobedience to God. Doctrine is not translated into duty. Jeremiah put it this way: “The word of the Lord is unto them a reproach; they have no delight in it” (Jer. 6:10). Imagine – experts in the Bible for whom the word of the Lord is not their delight! We are never more foolish than when we try to dress up the message of the Bible in the gaudy garments of our own making to make it acceptable. So let us continue to exalt the supremacy of Scripture over the puny thoughts of mere men (including my own and – dare I say it? – those of Calvin, Luther, Dabney, etc.). But even more importantly, let us remember that what we know intellectually must be obeyed volitionally if we are to delight the Lord. Thus, if a husband truly believes that his daughter should go to college, then a wife needs to trust both him and God for that decision. However, if a wife has concerns about that decision, there is no reason she can not lovingly present her perspective to him. She needs to understand why he feels this is important. Perhaps he has not thought through alternatives to going away from home but is just concerned that his daughter be well-educated. If you are in this situation, then be prepared to present other ideas to him for things your daughter can do. And, as with all things, pray for wisdom for yourself, your husband, and your daughter. I totally agree – well, almost. Becky and I make decisions together, and always on major issues like these. My thinking has constantly been: “Why should the Holy Spirit tell me to do one thing and Becky another?” We view marriage as a partnership of two people under the Lordship of Christ, who is the Head of our home. We don’t use words like patriarchy and dominion much around the house (this will not surprise anyone who is familiar with our views on church government). I understand biblical headship to mean that it is the husband’s divine calling to take primary responsibility for Christ-like, servant leadership (men, did you see that word "servant"? 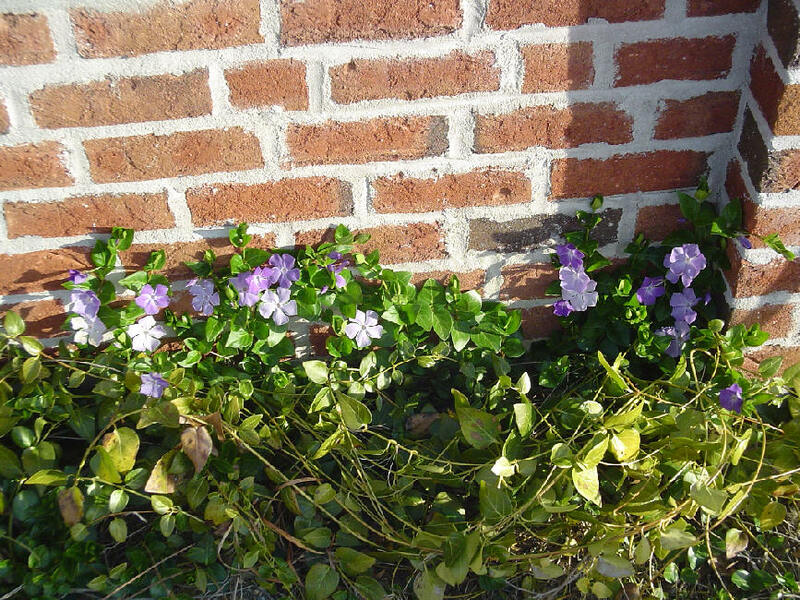 ), protection, and provision in the home. Biblical submission is the wife’s divine calling to honor and affirm her husband’s leadership and help him carry it out according to her gifts (and many times her gifts may excel her husband's in several, if not many, areas). But I also believe that married couples ought to act like Christians toward each other. This is, in fact, fundamental. As Paul wrote to the saints, overseers, and deacons of the church at Philippi, we are -- leaders and led alike -- to "be of one mind, having the same love, beingco-souled [so the Greek], having the same goal" (Phil. 2:2). Indeed, we are to esteem the other as more important than ourselves (Phil. 2:3-4). Please do not think that these passages do not refer to the marriage relationship. I think John MacArthur puts it well in his Ephesians commentary: “The husband who demands his wife’s submission to him but does not recognize his own obligation to submit to her distorts God’s standard for the marriage relationship and cannot rightly function as a godly husband.” So, my dear friends, as you work through Carmon’s excellent series, why not do it as a couple, discussing and praying over everything and comparing what Carmon has to say carefully with the Scriptures. Ask the Lord Jesus to give you unanimity, defer to each other's wisdom, and go slowly, with respect for each other’s opinions. I do not think that such an approach would bother Carmon in the least, and it is for your safety, if I may be so bold as to paraphrase brother Paul (Phil. 3:1). While I do agree with much of what the Constitution states, I do not believe these things because the Constitution states them. For instance, I do not believe in small government because the Constitution asserts it (though, again, the politicians in Washington do not pay attention), but because I believe that the Scriptures give government only a small sphere of authority; to move beyond that sphere is to transgress the law of God. This is a healthy perspective, and a good reminder that we who support the Constitution Party do not blindly follow what any man says when we try to winkle out the truth, if any, in what government types say. 9:28 AM Was Paul “gentle” among the Thessalonians or did he become like a “baby”? Textual criticism students will want to consult this essay before deciding. 9:22 AM Here’s an interesting essay on weblogs in education. I’ve been very impressed with the blogging I see by some home scholars. They seem to be way ahead of the curve on this one. I can see the day when most home educators have their own website. Fathers, never think that just because you didn’t begin the race well, you are entitled to sit it out. You are not called to win the race but to run it. Repent of your disobedience, and determine today that you will become the father that God commands, the father your children desperately need. Put aside your hopelessness and trust in the God of hope. Leave it in His hands as to how and when He will use your obedience in the good work He is doing in them. Rest assured that He will reward you according to your conduct, and that the reward will be abundant. Read It’s Never Too Late to be Faithful. 5 For neither at any time did we use flattering words, as you know, nor a cloak for covetousness—God is witness. 2 And he found a certain Jew named Aquila, born in Pontus, who had recently come from Italy with his wife Priscilla (because Claudius had commanded all the Jews to depart from Rome); and he came to them. 3 So, because he was of the same trade,he stayed with them and worked; for by occupation they were tentmakers. 4 And he reasoned in the synagogue every Sabbath, and persuaded both Jews and Greeks. 12 If others are partakers of this right over you, are we not even more? Nevertheless we have not used this right, but endure all things lest we hinder the gospel of Christ. 13 Do you not know that those who minister the holy things eat of the things of the temple, and those who serve at the altar partake of the offerings ofthe altar? 14 Even so the Lord has commanded that those who preach the gospel should live from the gospel. 15 But I have used none of these things, nor have I written these things that it should be done so to me; for it would be better for me to die than that anyone should make my boasting void. 7 Did I commit sin in humbling myself that you might be exalted, because I preached the gospel of God to you free of charge? 13 For what is it in which you were inferior to other churches, except that I myself was not burdensome to you? Forgive me this wrong! 8 nor did we eat anyone’s bread free of charge, but worked with labor and toil night and day, that we might not be a burden to any of you, 9 not because we do not have authority, but to make ourselves an example of how you should follow us. The Sheperd's [sic] Men is a ministry devoted to discipling Christian men from the inner city who fully delight in the glory of God, progress in experientially knowing Christ, have a vision for biblical manhood, are equipped to clearly communicate the Gospel of Christ to other cultures, and enjoy what God enjoys through walking slowly with Him. God’s goodness was never meant to lead us to complacency, especially about the needy among us. Their afflictions have not escaped His attention. May God bless this ministry in every way. 6:42 AM Good news. I just read that New Orleans Seminary has begun operations again on its main campus. I am thrilled to see such optimism in the face of terrible adversity. All the plagues that now beset us will be removed in the world to come, but God lives in us at present and we can claim as much of His power today as is necessary for our good and His glory. 6:37 AM If you can read Portuguese, Jayme Bourget has a good discussion of the Da Vinci Code and even cites my work on the Gospels. 6:32 AM "If you board the wrong train, it is no use running along the corridor in the other direction." D. Bonhoeffer. 6:30 AM Greek students! Here are some simple exercises you can do to become better acquainted with New Testament textual criticism. 1) Read this overview (with helpful diagrams) of the various text types of the New Testament by James Snapp. 2) You can also read Mr. Snapp’s review of Bart Ehrman’s Misquoting Jesus here. 3) Finally, why not try your hand at reading p46? 6:28 AM If you or someone you know is grieving over the loss of a child, this essay will be of comfort. 6:23 AM Over at Slice of Laodicea, Ingrid Schlueter posts some frightening statistics about Islam. 6:20 AM Yesterday I listened to a superb trumpet solo by the MacDonald family’s Bonnie (scroll down to #7). Having played the trumpet since I was in grade school I can appreciated the effort that went into her rendition. Keep up the good work, Bonnie! 6:16 AM Here’s a useful list of books on Christology by Chris Tilling. Not that it matters, but I would have made Cullmann’s magnum opus the #1 book on the list. Sinful flesh is not content with the reality of the one true God. It wants to fashion an idol in place of the invisible God who is spirit. There is always the temptation to act like the Jews of Saul's time who wanted a human leader they could see, rather than the unseen God (cf. 1 Kings 8:1-18). But God shares His glory with no man, not even "called men" who are promoted to demi-god status by their adoring flock. Such flocks too often find for themselves a man who likes to lord it over the flock. Thus a sinfully symbiotic relationship is complete with an abusive authority figure coupled to his idol-worshipping minions (Jeremiah 5:30-31). Read more. I’ll go out on a limb and predict that things will get a lot worse before they get better. 6:10 AM Need to review your Greek? 6:06 AM Yet another SEBTS student has started a website (with a great title, too). A hearty welcome to the blogosphere, Matthew. 6:28 AM Have you ever thought about the title "Reverend"? People who do not know that I am not ordained sometimes use the title before my name. But the title is a divine attribute and belongs only to God and not to man. 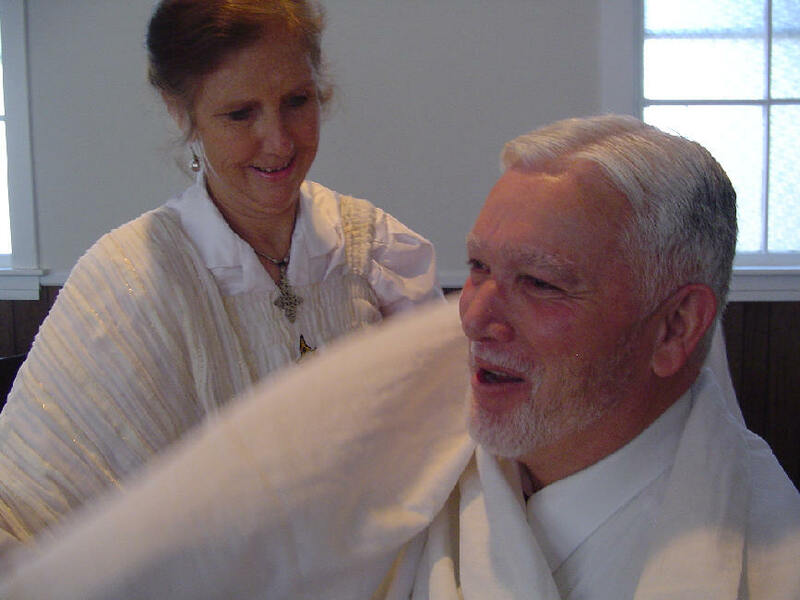 Psalm 111:9 says, "Holy and reverend is His name." If it is His name that is reverend, what right do I have to claim it for myself, whether "ordained" or not? Along with Rabbi, Father, and Leader, it seems to me that "Reverend" belongs in the category of the titles in Matt. 23:8-10. Use of such honorific titles elevates one man above another and as such denies the priesthood of all believers under the leadership of Christ. Despite all of our ecclesiastical titles, you will look in vain for officialdom in the New Testament. (Yes, the New Testament does mention a "senior pastor," but it's not one of us.) So a question: If Jesus is not ashamed to call us "brethren" (Heb. 2:11-12), why we should be ashamed to address each other as "brother" and "sister"? Brother Dave, I speak for myself, and I believe many more -- Bethel Hill is blessed to be a part of what God is doing in Ethiopia. Why God would allow us to be a part of what He is doing in Ethiopia is beyond us. I remember your prayer on the night the church presented the gift to the Burji church - you simply quoted Scripture and we have found God's Word to be so very preciously true: It is truly more blessed to give then receive - what a blessing to be a small part of what is taking place. My words are not even sufficient to describe yesterday. I have seen many reports on missions, but yesterday was by far the best. The reports you take to the other churches will be a great blessing to those churches (I believe). Brother Dave, Sister Becky Lynn, and Brother Nathan, God has truly given our church a love for your family and your ministry. 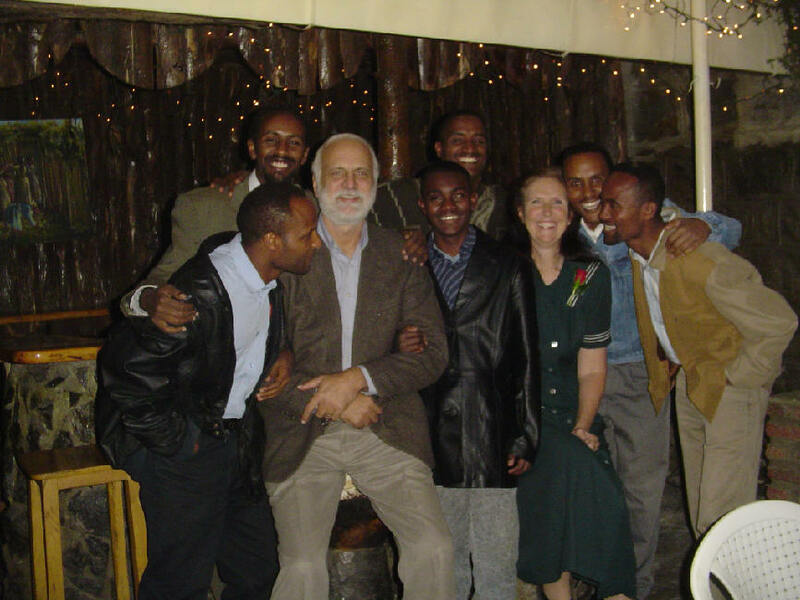 He has also given us a love for the people of Ethiopia as well. Today, I met with two other men at about 6:45 a.m. and we prayed for the church in Burji. We love you...and thank you, thank you, thank you for coming to be with us yesterday. May God bless your other engagements. Jason is absolutely right: only the Lord Jesus can give us a love for other people and make us want to give rather than receive. 10:45 AM Break time. We've been working in 50 degree weather. It feels much colder. The difference a week makes. 7:25 AM Becky has just written Part 4 of our Ethiopia Report. 7:20 AM Over at Beggars All James Swan has a good discussion of the significance of Greek voice for the correct interpretation and application of Scripture. A nice read if you've got the time. 7:17 AM Did you know that Southeastern College of Wake Forest has its own blogring? Check it out here. Our days are simple and full, and the activities and interests that we all share — homeschooling, our family-centered lifestyle and our Christian faith — are the focus of this blog. 7:09 AM When my wife and I lived in Basel, Switzerland we discovered the nation's love for rules and regulations of all kinds -- including when we could take a shower in our apartment. But speed limits on the slopes? Apparently yes. Sidebar: Most American doctoral students lived across the border in Germany and commuted to the university, since it was very difficult to get permission from the federal government to live in the country, and most didn't even try. I wanted to live in Basel itself and so I rented an apartment, opened a Swiss bank account, purchased health insurance and then reported our presence to the Swiss authorities. Our case was sent to the capital city of Bern for a final decision, and exactly one month before we returned to the states we received a statement from the federal government in the mail: Herr and Frau Black were granted official permission to live in Switzerland! And I thought the U.S. had red tape. 5:24 PM At lunch today I overheard someone refer to "the game." I honestly had no idea what he was talking about. Then it occurred to me that today must be Super Bowl Sunday. I can't even tell you who's playing. As I write this I am preparing to help Becky clean the house for our dinner guests tomorrow night then I'll be taking a long walk to check up on the pregnant goats. The big issue as I see it is good stewardship of my time and energy. Sports just do not have much of an attraction for me anymore, and TV I find disgusting. Just my two cents. 5:19 PM On behalf of beef lovers everywhere I am happy and proud to announce that we relished our cow heart enchiladas last night and, so far as I know, we are all alive and well. Becky added refried beans, cheese, and tomato paste and served chips and salsa on the side. Excellent, really. That's my food report for today. 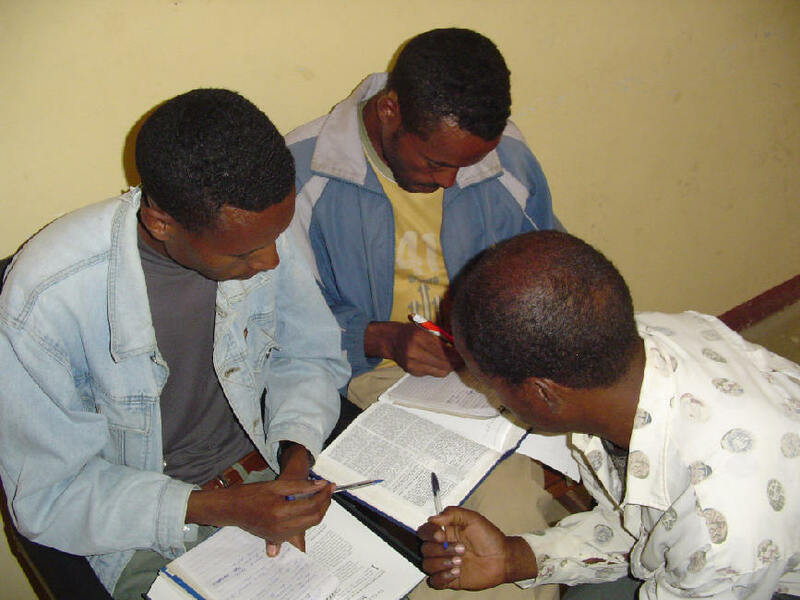 5:11 PM Today we began our Ethiopia reports to the churches, starting with our good friends at Bethel Hill Baptist. I was deeply moved during the service as Becky showed our slides and video clips of the "the church at the end of the world" in Burji. I spoke briefly on the two Greek words for "gift" in James 1:17 to show that not only everything we give comes from God but even the desire and ability to give comes from Him. The Lord Jesus has used Bethel Hills in a powerful and generous way to encourage the church in Burji. 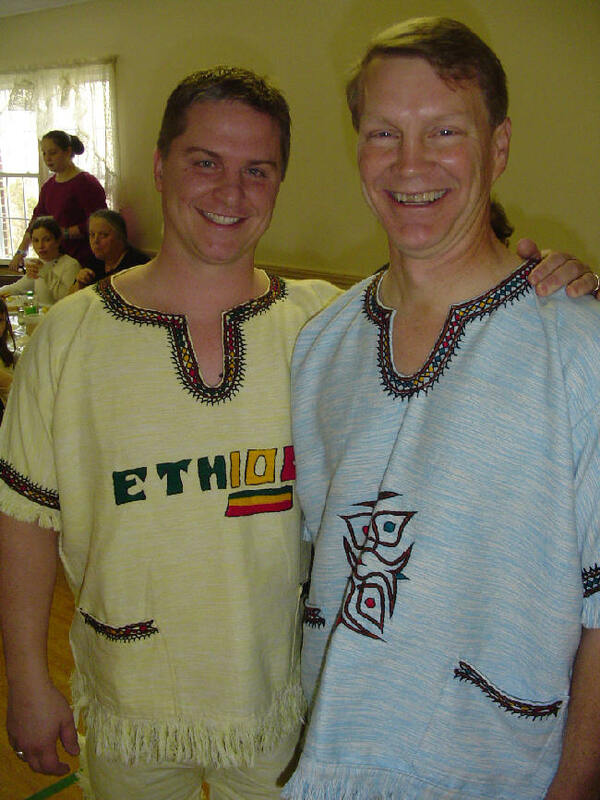 We brought greetings from the Burji elders and then presented pastor Jason and his deacon chairman with Ethiopian outfits, into which they changed for the covered-dish supper that followed the service (no cowards they!). God bless Bethel Hill and reward them for their generosity. I appeal to everyone who reads these words to get involved in missions and share the love of Jesus with those around you, however the Lord directs you. It may mean visiting the local nursing home or chopping firewood for a neighbor. The Lord of the Harvest will show you. Next whistle stop: Our home congregation, Averett Baptist Church, where we will speak this coming Sunday in both the morning (message) and evening (pictures) services. 5:43 PM In case we've forgotten it, the purpose of the church meeting is "for the sharing of concerns, the development of deep interpersonal relationships, questioning a teaching, the expression of love for one another, stimulating one another to good deeds, mutual encouragement or church discipline." Tomorrow, wherever you attend and no matter how traditional or emergent your church might be, be sure to show how much you love and appreciate those around you. 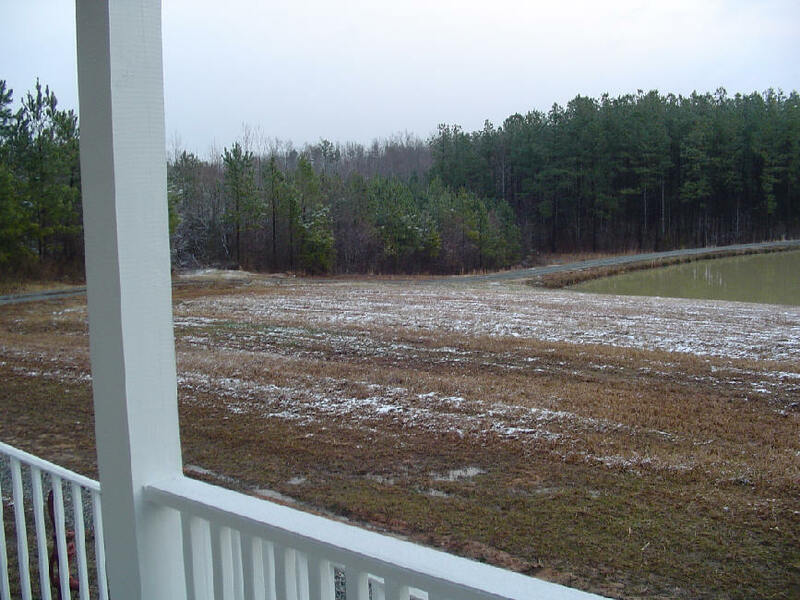 5:36 PM Check out the pics at the Halifax County website. This is the county next to ours and is oozing with historic homes such as Glenwood (pictured below). Though I've only lived in this part of the country for 4 years, I feel rooted here and have come to appreciate in a new way the unique contributions of Virginia to American history. 9:41 AM Greek students! You can find the major variant readings in the Greek New Testament at this online tool. 9:21 AM Did I tell you that I'm learning tons of stuff about trees from my son? Especially pines. 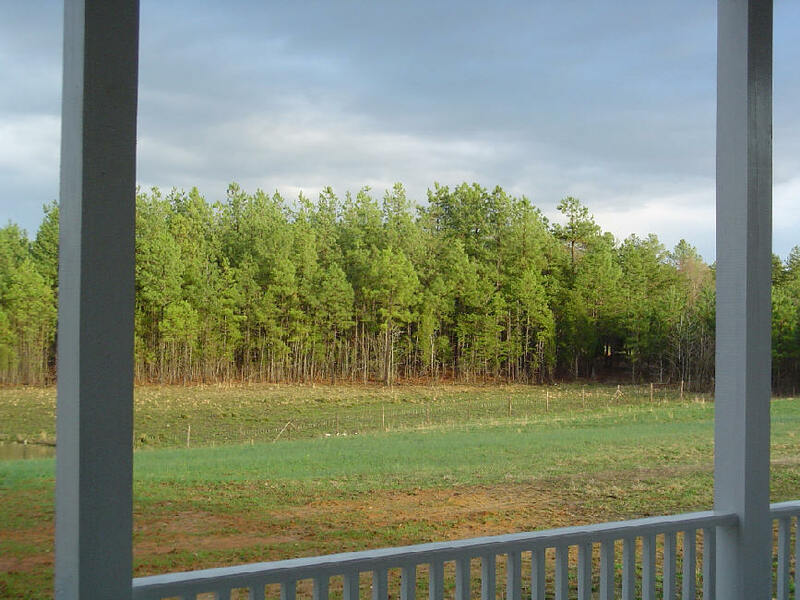 This is important, as about 80 percent of our property is wooded, and pines are a "crop" that can be harvested. I always assumed that the hundreds of pines we have are good news. But Nathan (our farm manager, and an excellent one at that) tells me that pines grow poorly if there are too many per acre. Deliberate control of stand density by thinning improves the growth rate and quality of the remaining "crop" trees. 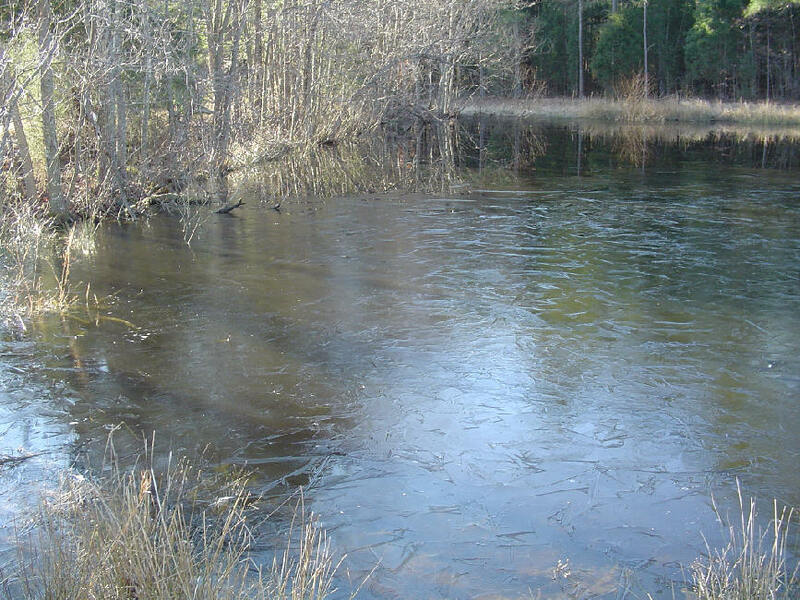 Pines need space in which they compete for water, nutrients, and light. So the fastest growing trees are the most successful and assume a "dominant" position in the stand, where they receive direct sunlight both from above and the sides. Nathan tells me that most of our pines will be ready for thinning in about three years. The smaller pines will be sold for pulp wood, then later we will sell off the larger ones. Which got me thinking: What areas of my life need "thinning?" 9:06 AM This essay on food aid to Ethiopia (Ethiopia's food aid addiction) made me think of the FDR-ing of the church. 5:00 PM Just back from the far reaches of our property. The Lord gave us perfect weather to work in today. For your information, here's our modus operandi for putting up fencing at Rosewood Farm. 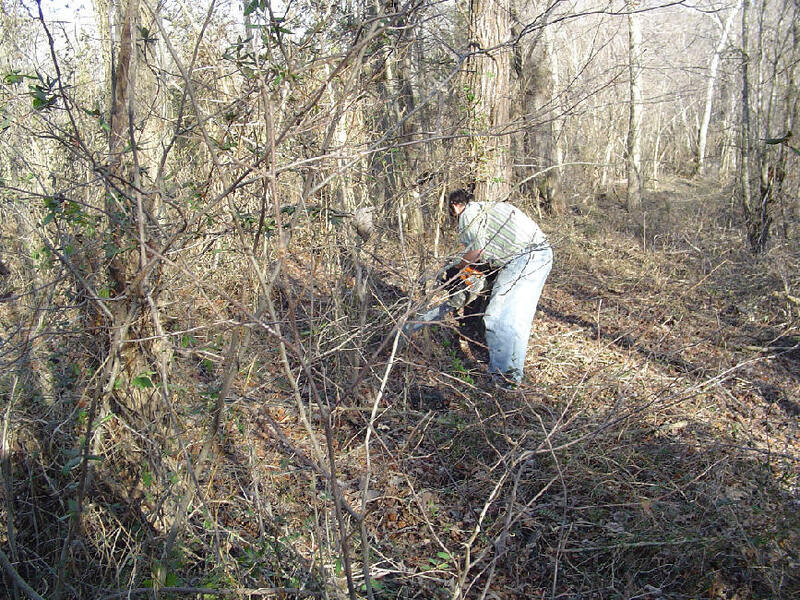 First we clear a path for us to work, using our trusty Stihl chain saw. Watch them briars, now! Then we unroll the woven wire, nail it to the line trees, and finish it off with one strand of barbed wire. Et voila! The goats are already licking their chops, what with all the vegetation they'll have this spring. Neat plan, huh? But remember: Nathan's the guy with the smarts. I'm just the willing assistant. 2:26 PM Just got in from working on the fences and saw this prayer alert from our good friends Jay and Ruthanne Shepherd. Let's all pray fervently and faithfully. 7:10 AM Had quite a first week in our textual criticism class. A course like this always draws a very eclectic crowd. Discussion ranged from Bart Ehrman's Misquoting Jesus to how to read uncial script to a recently published review of Robinson and Pierpont's text. The big highlight: discovering that there are "umlauts" in the manuscripts. I can remember my first class in textual criticism. That was very long ago. Sadly, things have not changed very much in this discipline in the meantime. When you consider that the editors of the UBS Greek New Testament haven't changed their minds since 1976 I suppose one could speak of a continuing interlude in New Testament textual criticism. Next week we'll be getting into the debate over the various theories that are in vogue today. Should be fun. Not that it matters, but I still believe that this course ought to be required. One thing's for certain: it's time to get away from group-think and begin to reexamine all of our assumptions about the text, whether or not one is pro- or con- the Majority Text. 6:40 AM Have you ever eaten cow heart? We did last night. Tasted like liver. It wasn't too bad but it needed steak sauce. 6:37 AM Good news. The barn shed is done. Today work continues on fencing in the farm, all 123 acres of it. Weather permitting, we hope to put up several hundred feet of wire today and tomorrow. One of the first things we learn is that the leadership model for the church is a team of elders, not a single individual at the top doing everything and making all the decisions. How did Paul live and serve among these people? First, verse 19 reveals that he served in humility. Paul didn't come in a boastful or arrogant way. He came in an attitude of meekness and service. He came to offer love to those he served, not to demand his own way. Faithfulness, rather than preservation of life, mattered to Paul. His ultimate goal was to finish the course that Jesus had laid out for him and to be found a faithful herald for his king. Being in a position to give rather than exercising authority to receive was a distinguishing mark of an elder. Our best understanding of the nature of godly leadership comes from the Scriptures. In them we see a striking contrast to the world's idea of how a strong leader looks and how he behaves. The other day in Text Criticism, you mentioned that every Bible student should have a Greek OT, and a Hebrew NT. I was wondering what are the best versions/editors to get for these volumes. I noticed when i looked them up that there were many different versions. I recommended to him the Hebrew New Testament by Delitzsch (it also contains the KJV) and the Zondervan Parallel Greek-English Septuagint. I don't know what I would do without my Greek OT and my Hebrew NT. 6:18 AM Job tip: Vanguard University in Southern California is looking for someone to teachOld Testament. Dr Black; I read your blog everyday and want to thank you for your articles. As you know I have linked to them several times. I am reading your greek materials. I have taken 2 semesters in seminary and would love to receive your workbook. 6:50 AM If you are using my Learn to Read New Testament Greek, have you gotten a copy of my workbook and CD yet? If not, they’re gratis. All it will cost you is a mailing address. And you are free to make as many copies as you like. 6:48 AM Good to see Pieter Friedrich blogging again. Pieter has contributed many fine articles to DBO in the past and I look forward to his further contributions. 6:42 AM Tuesday night for supper Becky made the best beef liver I have ever eaten. Maybe this had to do with the fact that it came from our own cattle. At any rate, I had leftovers for lunch yesterday and loved every bite. Liver, onions, mashed potatoes, and green beans. Food doesn’t get any better. 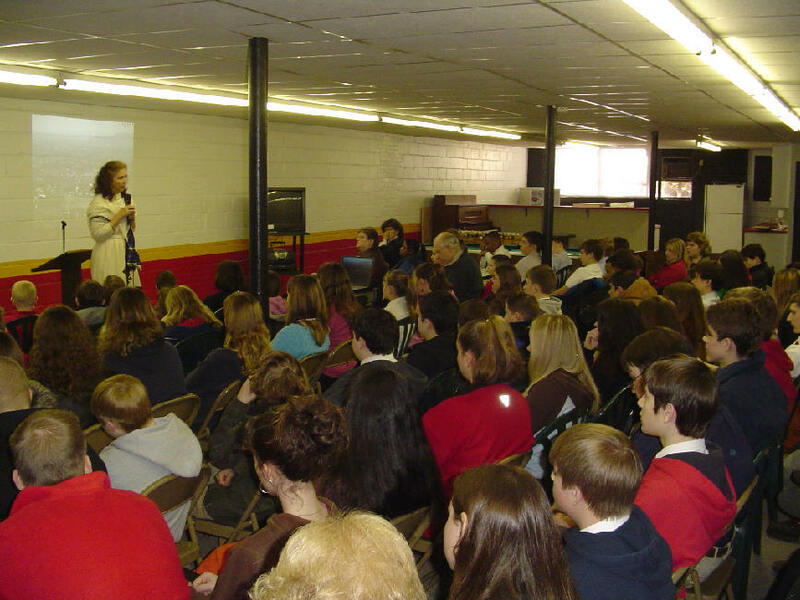 Thursday, Feb. 16, 9:00 am, Norlina Christian Academy, Norlina, NC. Sunday, Feb. 19, 7:00 pm, Norlina Baptist Church, Norlina, NC. Sunday, Mar. 5, 10:00 am, Grace Bible Church, Rocky Mount, VA. If you live in western Virginia I hope you can make it to the last-mentioned venue. Grace meets in a barn on a 50-acre farm. Most of the families are homeschoolers. If you need directions, let me know. We’ll have lots of pictures and video clips. Meanwhile, I’ll keep you informed on our doings, and by all means keep on praying for us. 6:35 AM Becky and I just completed a brief brochure called “Our Burden for the Churches in Alaba, Ethiopia.” People need to see what God is doing among the churches in this Muslim-dominated area of the country. We’re asking God to open many doors of ministry there, for if the Lord doesn’t open the doors nothing can be done. If you would like a copy, we would be happy to email it to you. 6:28 AM I was reminiscing today with a friend about my student days in Basel. It was a wonderful time in my life. I’m telling my own doctoral students that this can (and should) be some of the best days of their lives, as they learn the joy of researching and writing. I hope that one day they too will look back on their student days with joy. Although it’s been 25 years, it seems like yesterday that I was writing my dissertation and listening to such greats as Jan Milic Lochman and Markus Barth. As William Faulkner once said, "The past is never dead. It's not even past." 6:25 AM Havin truble speling? 6:16 AM I’m currently working on an paper dealing with the Lord’s Supper (a tricky area of church life) to present to the deacons of my church. I’m calling it, “Big Nibble Or Sibling Revelry?” Here are some key verses I’m focusing on: Acts 2:42; Acts 20:7; 1 Cor. 10:16-17; and Jude 12. Don't you love digging into the Scriptures and letting them speak for themselves? 6:48 AM We've just published the latest installment of our Ethiopia Report.